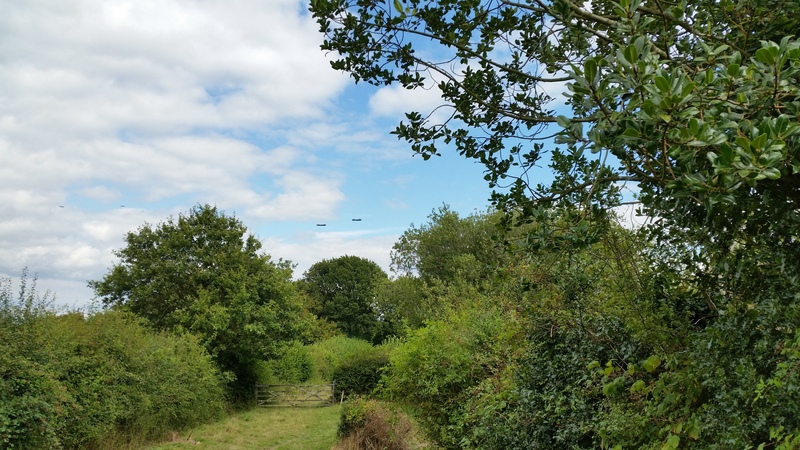 Two Lancaster bombers – the only two in the world – seen over Hunters Farm shortly before 3:00pm on 16th August. What are the two fighter planes that can also be seen following them, on the left of the picture? Click on the picture to view at full resolution. This entry was posted in Brightling. Bookmark the permalink. You spotted the RAF Battle of Britain Memorial Flight so the fighter planes following the two Lancaster Bombers were a Spitfire and Hurricane. The planes had been (or were going to) the Eastbourne Air Show.